Years ago, a fellow writer and I were comparing the types of main characters we often default to--as writers and as readers. She divided the romance character world into two types: the larger-than-life heroes vs. the regular guy heroes. Regular guy heroes seem to dominate Christian romantic fiction. These are by and large the kind of guy most of us meet in our day-to-day lives--the small town sheriff, the cowboy, the preacher. The larger-than-life hero is the alpha male. You're most apt to find him on secular romance bookshelves: the ubiquitous dukes, billionaires, and SEALs. He excels in his chosen field and exudes power and charisma. However, he often has a ruthless streak, which is probably why we see fewer of him in inspirational stories. Of course, we all know that some regular guys are Class A jerks and some successful businessmen and military leaders seek to emulate Christ in both their private and public lives. So what's a discerning Christian romance reader to do if she enjoys stories about a handsome, rich, powerful man laid low by his love for God and a good woman? Get her hands on the The Most Eligible Bachelor anthology. Two of our own Inkwell bloggers contributed to the collection, and last week, we celebrated their releases with some yummy…desserts. In Susanne Dietze’s “Love’s Reward,” architect Daniel Blair needs to focus his time and attention developing a set of plans for the final round of the International Architecture Prize. But his too-driven friend-turned-competitor has designed the perfect distraction. He’s placed a bounty on Daniel’s head, er, heart, with a $1,000 prize going to the woman who manages to end his bachelorhood. Now unmarried women from all over turn-of-the-century San Francisco are delivering baked goods to Daniel’s apartment, leaving notes at his office, and accosting him in the street. In desperation, Daniel turns to his long-time friend Josie Price to act as his human shield. If the other women think his heart is already spoken for, perhaps they will find another target for the attentions. Poor Daniel. His heart really is already entangled…but will Josie ever see him as more than a friend? Gina Welborn uses the ever-popular state of Texas as the setting for “Baker’s Dozen.” Duke Baker is a successful Fort Worth businessman, a loving father to a five-year-old daughter, and a grieving widower of two years who still wears his wedding band. He doesn’t think himself ready to marry again, but his daughter really needs a mother, so he goes along with his father’s scheme to introduce him to twelve eligible debutants. Alas, Duke just isn’t at ease in social situations, and he can be incredibly oblivious about matters that don’t concern his business. He’d love nothing better than to dump the whole gracious host gig into the lap of Irie La Croix, the daughter of the Baker housekeeper. But Irie is planning a life far away from Texas. Will Duke realize before it's too late that love can come again...with a lucky 13? I love novellas. These bite-size stories are the perfect length for the busy reader who often can’t pick up a book until the kids are in bed. Because I can finish them in one sitting, I'm not left hanging until I can find another short burst of time or tempted to sacrifice so much sleep that I pay for my reading binge the next day. However, short stories present challenges for the writers. Because the lower word count makes it harder to develop a new relationship between the characters, writers frequently utilize a reunion or a friends-to-lovers story structure where the main characters already know each other. Both Susie’s and Gina’s are a friends-to-lovers style stories, and I found this unusual because I personally think it the more difficult type to credibly pull off. For the romance to work, the main characters need to have some sort of revelation or catalyst that causes them to see an old friend in a new—non-platonic—way. But even after the characters acknowledge the attraction to themselves, should they risk a valued friendship by introducing romance? What if the romance goes awry? Will they lose the friendship? Of course, I already knew the books would end with "And they lived happily ever after," but the how-do-we-get-to-there kept me reading. Interestingly, despite their short length, both stories also have a secondary focus on the heroes’ relationships with their fathers (and to a lesser extent, the heroines’ relationships with their mothers). And while this could have detracted from the romance in such a short story, instead it nicely added dimension to the characters and depth to a story format often not credited with complexity. 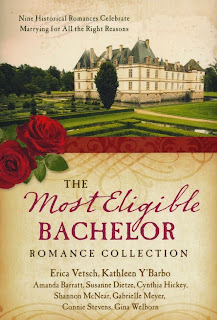 "Love's Reward" and "Baker's Dozen" are two of the nine novellas in The Most Eligible Bachelor, so after you finish reading about Daniel Blair and Duke Baker (yes, the heroes of these two stories really do have the same initials), you get seven more luscious heroes to fall in love with read about in this anthology. Thanks for the review, CJ! Pretty cool to see a review of my first release here on the Inkwell. Interesting that you picked up that our heroes have the same initials. Another fun fact? Both Gina's hero and Kathleen Y'Barbo's share the surname of Baker. No relation, of course. But their names are important to their stories! Susie, I read yours and Gina's first, and then I went and peeked at several of the other character names to see if DB initials thing was a requirement for the anthology--Darling Bachelors or something. Congratulations again! Hope you are enjoying your rise to fame. I'm glad you're enjoying it, DeAnna! I really had to hunt for that video, DeAnna. The official video for the song wasn't...appropriate for Inkwell. I thought the person who put that one together did a really nice job matching the song lyrics with Fred Astaire's facial expressions.